Women’s Golf Captures Eighth Consecutive Championship Title | The Gettysburgian. Women’s golf won their eighth consecutive Centenntial Conference championship (Photo Courtesy of David Sinclair). 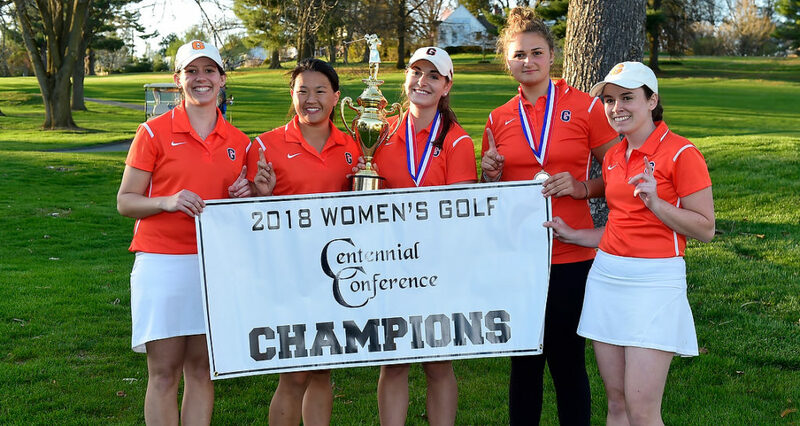 The Gettysburg College women’s golf team earned its eighth-straight Centennial Conference Championship with an elite team effort this past Sunday at the Conestoga Country Club. In the opening round Saturday, the Lady Bullets edged a 19-stroke to lead them into the final. The Bullets started out with a team score of 352 on the par-70, 5,801-yard course. By the end of day one, the Bullets were ahead of eventual runner-up Dickinson College, which had a score of 371, and Ursinus College, which was just two strokes behind. Sophomore Hannah Fireman led the team with a first-round 83, which had her in third place behind Alessandra Bertacche of Marymount University and Emily McGarrigle of Ursinus College. Her opening nine were up and down, before she stabilized on the back nine with five pars. Sophomore Skylar Frankiewicz was two strokes behind Fireman with a fourth place 85. While sophomore Erin Schroeder carded a season-low 90 to finish in ninth, junior Gillian Marini tied for 13th with a 94 and senior Caroline McDonald finished 23rd with a 103. The Bullets strong showing continued onto Sunday and resulted in the win. Gettysburg ended up with a combined 714, shooting a 362. This performance made it the fifth consecutive Gettysburg College women’s golf championship that was decided by 30 or more strokes. The Bullets success comes with impressive performances by the entire team. The Lady Bullets had three golfers in the top 10 best scores of the weekend. Frankiewicz and Fireman came to play this weekend. Not only did they tie for third with a score of 170, they also added to their trophy cabinets by both earning their second All-Conference honors. Schroeder, Marini, and McDonald all finished their season strongly, helping secure Gettysburg’s large lead. Schroeder earned 10th-place after opening the weekend with a 90, her two-day total was 184 (90-94). Marini paced close at 98. She tied for 17th with a score of 192 (94-98). Alessandra Bertacche of Marymount University won the first place, ending the six-straight individual championships by the Bullets finishing with a total of 161 (79-82). Emily McGarrigle of Ursinus College was second with 167 (79-88). Fireman snatched her second consecutive third-place effort at the event. After being last year’s CC Rookie of the Year, she posted three pars on both the front and back of the course on the way to an 87 on day two. Frankiewicz, who placed fifth last season at the conference championship, shot a solid 85 in both rounds. The champions are moving on to the national championship tournament with their win at the Centennial Conference Championship. This will be Gettysburg’s fifth consecutive trip to the national championship. The Bullets finished 13th of 22 teams at last year’s NCAA tournament, which was Gettysburg’s strongest ever finish on the national stage. “The most important thing is to manage our school and practice schedules so we can play the way we want,” said Frankiewicz. This championship marks the ninth in the program’s history and the longest streak in conference history. The Bullets nine total championships leads McDaniel College with only 7. The Bullets also surpassed the women’s swim team as the most consecutive Centennial Conference titles by a Gettysburg team in school history. Women’s swimming still holds the record for most ever consecutive conference titles with 16 from 1994-2000. The Bullets will compete at the NCAA Division III Championships from May 8-11 at Mission Hills Resort Golf Club in Howey-in-the-Hills, Florida.